In the late 1980’s members of the Lamberton Senior Citizen Organization began working on plans for a Community Center that would include a Senior Citizen Club Room. After a lot of hard work and fundraising they were able to secure grants from the Area Agency on Aging and the Southwest Initiative Fund for a Community Center. The group received cash donations of $48,327 and over 2,681 hours of labor were donated to build the center. The City of Lamberton and Lamberton Township also contributed to the project. Construction began in July 1992 with the razing of the Berton Theater building at the site of Community Center. Construction was completed in December 1992, with an open house held on January 16, 1993. The Community Center houses the Public Library, Lamberton Township Offices and a meeting room with full kitchen that can seat up to 75 people. 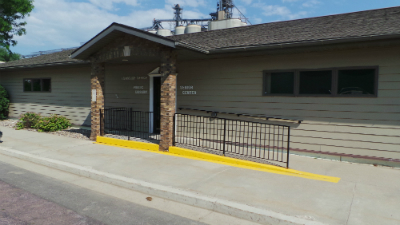 The Community Center is a smoke free and handicapped accessible building. The building is located at 101 2nd Avenue East and is the polling place for Lamberton Township and City of Lamberton elections. To reserve please call the library at 507-752-7220. 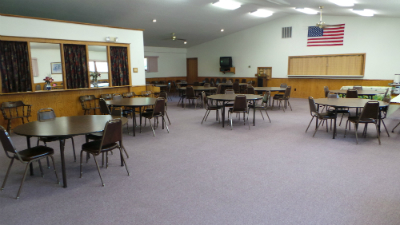 Hall rental is $50.00 per day. Payment is to be made out to the City of Lamberton and brought to the Lamberton library. All kitchen items, such as appliances, coffee pots, dishes, silverware, etc. are available to the renter.